The Diabetes Specialist Nurse and Health Promotion events… not just a day out of the office! The Greater Lincolnshire partnership has been making referrals to the NHS DPP as a wave one site since July 2016. In this time the partnership has grown from strength to strength with 5,874 referrals being made by almost 90% of its practices since launching. Up to September 2017, the partnership has had 107 groups started or scheduled to start in locations across Greater Lincolnshire. A key element of this success has been the use of allocated funds to employ a Project Officer. This role proactively works with GP Practices, acting as the key contact for the NHS DPP. They have ensured the correct protocols are installed on the clinical system to quickly identify eligible patients and ensured the referral process is easy with the availability of integrated referral forms. They are also able to support practices with any queries and act as a key link with the provider, ICS Health and Wellbeing. 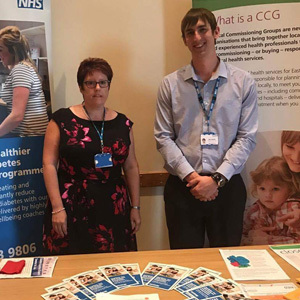 Greater Lincolnshire has also undertaken a range of engagement activities to promote the NHS DPP, including attending patient events, developing patient material in Eastern European languages and paying practices to send letters to encourage patients to attend the programme. The challenges for Greater Lincolnshire have mostly been around rurality. A large number of referrals need to be generated in order to have enough people to start a group, and in some areas of Lincolnshire it can be difficult when populations are spread over large areas. A new challenge for Greater Lincolnshire is the limit on the number of interventions that are available. The partnership successfully bid for a 50% uplift, however due to the high number of monthly referrals, there is a risk of running out of places before the end of the current contract. If you have any queries about NHS DPP in Lincolnshire, please contact Joanna Hart, Improvement and Delivery Manager, South West Lincolnshire at joanne.hart@southwestlincolnshireccg.nhs.uk.